Product information "Deuter Trans Alpine 28 SL cranberry-coral"
Our favorite all-rounder has reinvented itself! Sleek, more modern and more versatile, the Transalpine now goes with ... wherever! In the front of the net, not only the helmet can be stowed, but also equipment, purchases and much more. The mobile phone pocket is easy to reach without removing the backpack. Large zipper openings make the front and bottom pockets extremely accessible and organizational compartments provide an overview. The transalpine is the favorite for years thanks to the three-zone cover at the back and the compact fit thanks to the wide-in-the-hip waist fins with auto-compression system. The anatomical shape of the shoulder straps ensures a pleasant freedom of movement. Two Airstripes cushioned with ventilation ducts and Air Mesh cover ensure maximum air circulation through low backrest. Bilaminate build-up from a stable and a soft foam layer ensures high wearing comfort and optimal load distribution. The detachable waist belt (Gogo, Graduate, Giga, Gigant, Giga Pro) stabilizes the daypack with heavy load. 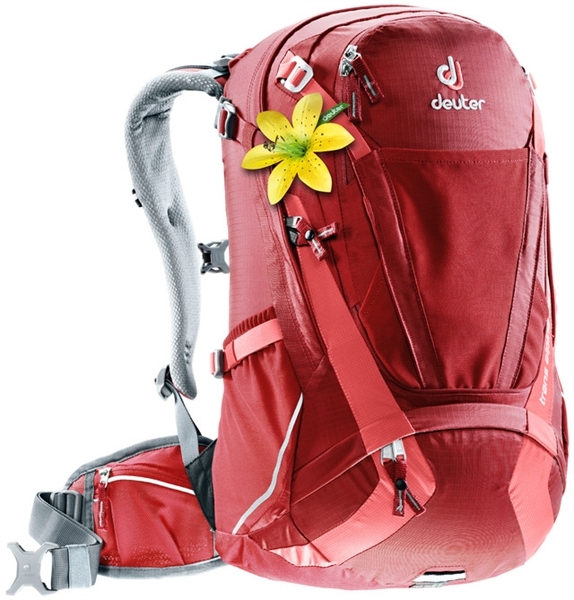 Related links to "Deuter Trans Alpine 28 SL cranberry-coral"
Customer evaluation for "Deuter Trans Alpine 28 SL cranberry-coral"